USS Enterprise (CVN-65) was the first nuclear-powered aircraft carrier. The Enterprise Class was originally intended to consist of a fleet of six ships. USS Enterprise has a length of 1,123ft, making it the longest carrier in the US Navy. USS Enterprise is armed with three Mk 29 Nato Sea Sparrow Guided Missile Launch Systems. USS Enterprise (CVN-65) was the first nuclear-powered aircraft carrier and the largest active warship in the world. She entered service with the United States Navy in November 1961. Nicknamed ‘Big E’, she was built by Newport News Shipbuilding (acquired by the Northrop Grumman Corporation in 2001). She celebrated her 50th anniversary on 25 November 2011. "Formal decommissioning of the ship is expected to take place after 2015, following the removal of its eight nuclear reactors.."
USS Enterprise is the only ship of its class. She is preceded by Kitty Hawk Class and succeeded by Nimitz Class. 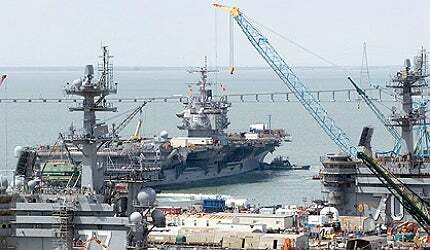 She will be replaced by Ford Class aircraft carrier, USS Gerald R. Ford (CVN-78), which is expected to be commissioned in 2015. The Enterprise Class was originally intended to consist of a fleet of six ships. The other five Enterprise-Class ships, however, were dropped due to escalating construction costs. In April 2008, a contract worth $453.3m was awarded to Northrop Grumman to undertake maintenance work on the ship. The project was undertaken by Northrop Grumman Shipbuilding, the shipbuilding arm of the company. She was re-delivered to the US Navy in April 2010. The maintenance cost at the time of delivery was reported to be $662m. It was the ship’s last scheduled dry docking prior to its deactivation which began on 1 December 2012 at Norfolk Naval Station in Virginia. The deactivation is expected to be completed before 15 March 2013. Formal decommissioning of the ship is expected to take place after 2015, following the removal of its eight nuclear reactors. CVN-65 was originally designed for a service life of 25 years. The service life was lengthened due to timely maintenance and proper upkeep. The ship’s hull design is a modification of the Forestall-Class carriers. The ship initially featured a typical square island that was used to support phased-array radars and electronic warfare systems. These were replaced in 1980. "USS Enterprise is the only ship of its class. She is preceded by Kitty Hawk Class and succeeded by Nimitz Class." USS Enterprise has a length of 1,123ft, making it the longest carrier in the US Navy. Its waterline beam is 132.8ft, draught is 39ft and displacement is 94,781t. Flight deck area is 4.47 acres and its width is 252ft. The area of the hangar bay is five acres. Construction authorisation of the ship was given by the US Congress in 1954. The keel of the ship was laid in 1958. The vessel was launched in September 1960 and the commissioning took place on 25 November 1961. The maiden voyage was undertaken in January 1962. During initial sea trials, her speed exceeded 40 miles an hour. The ship is fitted out with four aircraft elevators, four steam-powered catapults and four arresting wires. She can launch and recover aircraft simultaneously. It took around 900 shipyard engineers and designers to create the ship on paper. More than 800 companies supplied the construction materials that included 60,923t of steel, 1,507t of aluminium, 230 miles of pipe and tubing and 1,700t of one-quarter-inch welding rods. An extensive refit programme was undertaken between January 1979 and 1982. Island superstructure was rebuilt and new radar systems and a mast were fitted out to replace the electronic counter measures dome and the billboard radar antenna. Depending on mission demands, the ship can embark more than 90 aircraft, but can carry only 66 at any given time. In general, an embarked air wing on the ship comprises four EA-6B Prowler offensive electronic warfare aircraft, four E-2C Hawkeye electronic early warning aircraft, five SH-60F Seahawk anti-submarine warfare helicopters, six S-3B Viking anti-submarine warfare aircraft and 43 F/A-18 hornet strike fighters. USS Enterprise is armed with three Mk 29 Nato Sea Sparrow Guided Missile Launch Systems and three 20mm Phalanx Close-In Weapon Systems (CIWS). The ship also has two Rolling Airframe Missile (RAM) systems. The ship is equipped with an SPS-49(v)5 C/D band long range air search radar, SPS-64(v)9 I-band navigation radar and SPS-48E 3D C/D band air search radar. Other radars onboard include an Mk 23 target acquisition system (TAS) D band system and an SPQ-9B surface search and tracking radar with sea-skimmer capability. An SPN-46 precision approach landing system, SPN-41 electronic carrier landing system and SPN-43A air traffic control and marshalling radar make up the ship’s aircraft management radars. Command and control systems are comprised of an SPQ-14(v) Advanced Sensor Distribution System, Mk 91 Guided Missile command and control system, ACDS Block 0, USQ-119E (V) 27 – GCCS-M (Maritime Global Command and Control System) and SSQ-82 electronic emission management system. The propulsion power for the ship is generated by eight Westinghouse second-generation A2W nuclear reactors. The four Westinghouse steam turbines produce 280,000HP. The propulsion is provided by four propellers, each containing five blades. There are four rudders, each of 35t, and two anchors, each of 32t. The 38,000t, nuclear-powered aircraft carrier Charles De Gaulle was constructed at the DCN Brest naval shipyard in Brittany. The first aircraft carrier of China, Liaoning (Varyag), entered service with the People’s Liberation Army Navy in 2012. Liaoning (Varyag) was originally developed as an Admiral Kuznetsov Class multirole aircraft carrier by the Soviet Union.